Geraldine Swayne: vocals/ guitars/ accordion/ banjo/ piano/ bass/ viola. James Johnston: vocals/ guitars/ organ/ harmonica/ autoharp/ viola/ cello/ piano/ bass. a.k.a. founder and leader of Gallon Drunk / member of Nick Cave & The Bad Seeds. Steve Gullick: vocals/ guitars/ cello/ organ/ bass/ tonka. This is a co release with the London based label TV Records. Mojo says: "...Bender's full-length debut is spine-shivering, nocturnal almost-blues for the love-lost and sleep deprived." Plan B says: "...Bender rave like a tramps' tabernacle choir." "This is the scariest record I have heard in a long time. to be.....believed. - Greg Trout, MagnaPhone.com "
Featuring eleven all new songs, Indian Summer is the long awaited follow up to their critically acclaimed cd Wanderlust. Recorded and mixed entirely in their basement studio in Toronto, Canada! Chicklet make luscious, bubbly rock augmented by Julie's breezy, personal vocals and layered harmonies. Indian Summer shows a more mature, confidant band at total ease with infusing their special brand of pop with ethereal ambiance, evocative storytelling, and a dreamy, spacey groove. 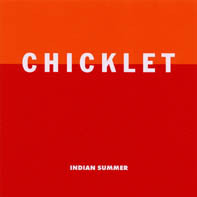 With influences ranging from the great pop hits of the 60's and 70's to the post punk sounds of Manchester on through the whole 4AD era to the current state of the 21st century, Chicklet have created a sound of their own all the while holding on to their innate sense of melody and harmony. This is their fourth Satellite release. Odd Indie guitar pop with glockenspiel, squeeze box and violin thrown for good measure. Italia's voice and J.P. Cobb's guitar create some interesting tension. They have said they have no idea of how to explain themselves. Others have used the words poppy, edgy, dreamy, schizophrenic and intense to describe their music. They do know that no matter what they say about their music, people are going to come to their own conclusions. It doesn't matter if it's the graceful and heartfelt vocals of "I Said I Said I Said" or the rockin crash and bang of "Sliding West" or better still, the sing along pop of "Noni", we know you are going to love this 5 song cd/ep. Goldmine "Chicklet bash you with sixties pop sensibility that never sounds retro or kitschy. This is pure pop at its most sinful". The Big Takeover "...contenders in the scruffy, edgy indie pop sphere. Highly likeable." 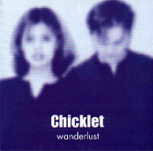 Vox Magazine calls Chicklet, "disarmingly melodic". Chart Magazine "...borrow the sugar from pre-acid '60s, tempting one to label Julie Park and Daniel Barida a Sonny and Cher for the indie-pop set." Factsheet Five "It's quite reminiscent of a walk in the park on the first sunny day after months and months of rain..."
Excellent follow up to last years "You don't know us, but we know who you are". 12 all new songs that are heavier, moodier and trippier than ever. With a slightly revised line up, Feverdream gives us a collection of carefully worked and intelligently conceptualized songs that make up a disc of low hype - high impact music. Db magazine in Australia has already hailed this release as "One of the best collections of songs to be released by an Australian band in the last decade". As we said in the write up of their previous disc, "what more can we say?" Old school meets new school on this all new 12 track CD filled with swirling punk rock. Short, fast and to the point, Million Six packs this disc with stuttering guitars and sing along melodies that will leave you begging for more. With the addition of new bassist Jerry, the trio enters a new phase in their quest to conquer the world. If you are faint of heart or suffering from high blood pressure - Stay Away! Picking up where they left off on their "Free Sticker Inside" ep, Million Six chip away at the old guard and add new life to a sometimes stagnant genre. Punks not dead yet! Hard, fast punk rock with lots of guitars and vocal hooks. Hot on the heels of their appearance on the Damned tribute CD come 5 songs influenced by everything from the angst of everyday life to the "Little Rascals". Includes a blistering version of the Stones "Play With Fire" and of course, a free sticker! Think Misfits or The Damned at their poppy best. "Musically, these guys show up their peers with balls the size of cantaloupes" - Grid magazine. Debut release from this dreamy pop duo from north of the border. Toronto, Canada's Chicklet brings us three tracks of 70's inspired pop. There is a bit of a 4AD influence but even so, this release caught many by surprise. Yeah Yeah Yeah says "Definitely worth checking out" and Instant says "The song writing is top notch". Check out their five song CD, "Lemon Chandeliers" by this boy/girl duo. "Premiere" is on the purplest purple vinyl.